Here in this Great Southern Land — which, over the weekend turned into the Great Scorched Land when the fifteen hottest places ON THE PLANET were all on Australia’s Eastern Seaboard — our children have started a new school year. But anyway, it wasn’t the heat or any of that other stuff that caused me to lose my mind, people. Yes, yes…I get the general principle. It’s the execution I struggle with. I TOTALLY LOST MY SANITY COVERING MY CHILDRENS’ SCHOOL BOOKS IN CLEAR PLASTIC ADHESIVE. Yes, you know what I’m talking about…I can sense you all nodding sagely and feeling my pain, because I suspect that you, too, have experienced it. Here in Australia clear plastic adhesive is commonly called “Contact”, though I’m no longer sure whether this is because Contact is the brand name used by the major manufacturer of the diabolical stuff, or because contact with your children is likely to be limited by whatever they’re currently calling the government department that deals with emotional abuse after you’ve finished screaming expletives and threatening violence covering all their school books. I mean, I try. I really do. Most things about being a mother of primary school aged kids I think I’m reasonably good at. My children generally turn up at school wearing the right uniform and carrying the correct equipment. Including their nutritious lunch and recess and fruit break and water bottle. But covering school books in Contact? I’m utterly woeful. Completely hopeless. Borderline dreadful. …well, until I totally bungled covering one of the books and, when trying to remove the plastic adhesive from the cover, ripped one of my kids’ ornately decorated cover page in two. (This, to be honest, may actually have happened more than once). I’m so sorry, I whispered. My younger daughter looked down at the mess I had made, aghast and uncharacteristically silent. The older one — who has now had her books butchered by her mother for the fourth consecutive year — was a bit more supportive: she sighed (quite philosophically, I thought), shrugged, and said: Well, Mum, you did your best. Which I did. Really, I did. And I promised them that next year, Next Year, would be different. Because next year, I am going to be PREPARED. Next year, I’m going to study all those lovely Pinterest tutorials that do their utmost to appraise you of the tried and tested tips and tricks for book covering — and look! Oh, will you just look at their darling photographs of the seventeen new and exciting ways you can cover your books: decoupage covers, coloured duct tape covers, ombre linen covers, crocheted covers. Next year, I am going to source the highest quality clear plastic adhesive money can buy for covering my childrens’ school books, and I am going to unroll said adhesive (probably down the entire length of my house) and weigh it down for a week or three so it does not spontaneously and sadistically re-roll itself during said covering process. Next year, I am going to make a quiet trip to the family doctor and get a prescription for beta-blockers (and/or whatever else he’s prepared to give me), followed by a stop at the nearest bottle shop for some tequila (or any other clear, water-like substitute, with which to wash those tablets down). Summer. Glorious, sultry, turbulent summer — the subject of this Great Southern Land’s greatest love affair. The season we yearn for, along every seaside centimetre of this vast island’s perimeter, in this sand and saltwater obsessed nation of coast-clingers. Our time of glorious wonder, complete with severe clear skies and the solace of a seabreeze on a sweltering day. Anyone born within cooee of the coast can tell you the signs. It’s not just the rising temperature, the lengthening days, the lingering golden light of evening. 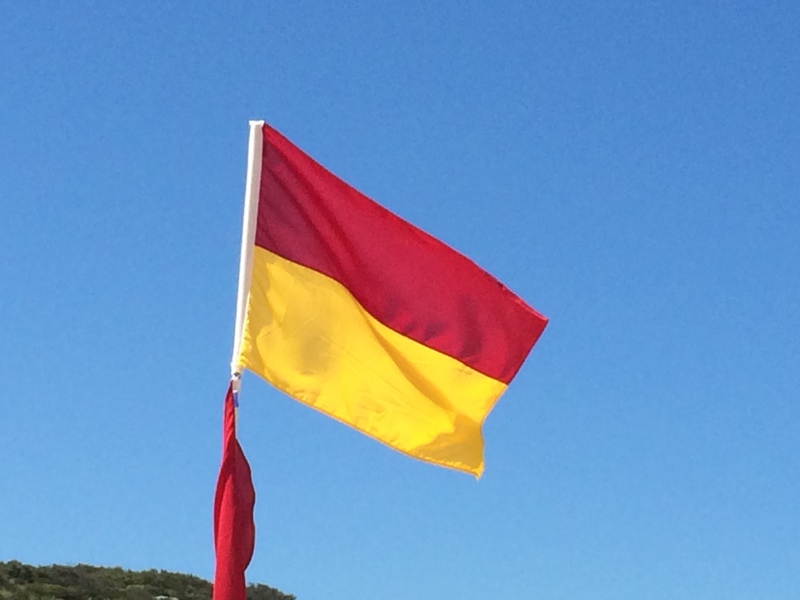 It’s the flags going up at the start of the Surf Lifesaving Season, and the banners advertising registration days for Nippers. It’s in the sharp briny scent of the sea, the smell of sunscreen and surfboard wax. It’s in the first incessant, maddening calls of the koel. The thwock of cricket balls in the nets at the local park, as footballs are ditched in favour of willowtree bats and dreams of one day wearing the baggy green. The crash of the screen door after the kids have been reminded for the zillionth time not to let the mozzies in. The satisfying crunch of a Stelvin cap unscrewing from the top of a crisp Sav Blanc on a Saturday afternoon. It’s the slide into Daylight Saving Time on the October long weekend, when altering the clock also requires adjusting your headspace, signalling the start of the great unwinding of the end of the year. The deep exhalation as we shuck off out shoes and slip into thongs — we’re talking footwear, here, people — secure in the knowledge that once the race that stops the nation is run on the first Tuesday in November it’s just a few short weeks until the rounds of office parties and Christmas drinks begin. It’s in the grin that tugs at the corners of your mouth on the first really hot day, knowing that soon enough there will be six weeks of school holidays, of tracking towel-slung to and from the beach, of backyard barbecues and endless lawn mowing, of a whole season of sand being trailed through the house and ever-present in the shower recess, and nights so warm that the sheets are kicked off every bed in the house as cicadas shrill and the Southern Cross wheels overhead in the deep Antipodean darkness. I felt that grin today. Ah, Summer. It’s really on its way.